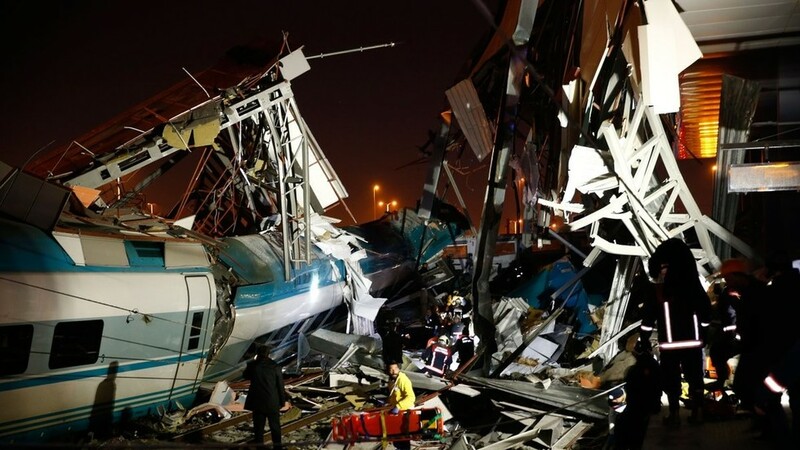 At least nine people have been killed and 47 injured in the high-speed rail disaster in Turkey's capital. The staff are suspected of negligence after a high-speed train hit a railway engine and crashed into a pedestrian overpass at a station in Ankara. Four people have died and 43 more were injured The accident occurred around 6.30 am (3.30am GMT) as the train was travelling between Ankara and the central Turkish province of Konya. The drone footage shows the devastation of the crash as the remains of the carriages and the collapsed overpass can be seen from above. The train was reportedly beginning a journey from the station in Ankara to the city of Konya in western Turkey. There were 206 people on board, according to state news agency Anadolu. Ankara Gov. Vasip Sahin said a technical inspection has begun while NTV television, quoting unnamed officials, said three prosecutors were assigned to investigate. "The train was not fast at that time yet", she said. U.K. Ambassador to Ankara Dominick Chilcott, EU Turkey Delegation head Christian Berger, the U.S and Pakistani embassies in Ankara were among the foreign delegations that offered their condolences after the accident.